I’m tired of the heat. As much as I definitely prefer heat to cold, I could (and I probably speak for Texas too) really use some cooler days. This week, I decided to make something easy, decadent and cold. My preferences aren’t in order. Pie 38 is an ice box pie (so no baking) and is called You Got Your Chocolate In My Peanut Butter ice cream pie. This is an evil-in-the-best-kind-of-way cold pie. Heat begone! Set ice cream out of freezer to soften. Take 8 ounces of teddy grahams and put in food processor. Blend until fine. Take out a quarter cup to layer between ice cream layers. Melt your butter and add to remaining crumbs. Mix with a fork until blended. Press into bottom and up sides of a 9 inch glass bottom pie pan. Place in freezer for a minimum of 15 minutes. 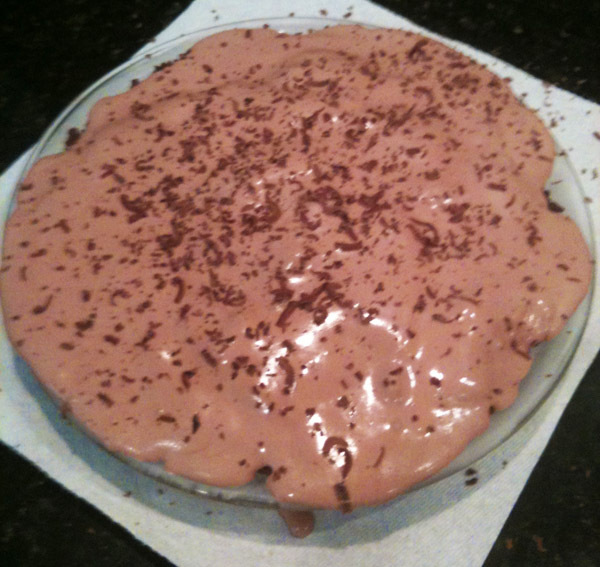 Remove the crust from freezer and spoon in softened chocolate ice cream into bottom of plate. Smooth and add your quarter cup of reserve crumbs on top. Place back in freezer for a minimum of 15 minutes. Remove and spoon in your softened reeses peanut butter cup ice cream over chocolate ice cream layer. Grate chocolate bar over top for garnish. I’ll be trying this with the kids when they get home. It will be yummy and is perfect for the hot summer days of August. Today was a day of labor. I mowed the lawn (a downside of the American Dream, especially in 98 degree heat) and did a lot of plant pruning. 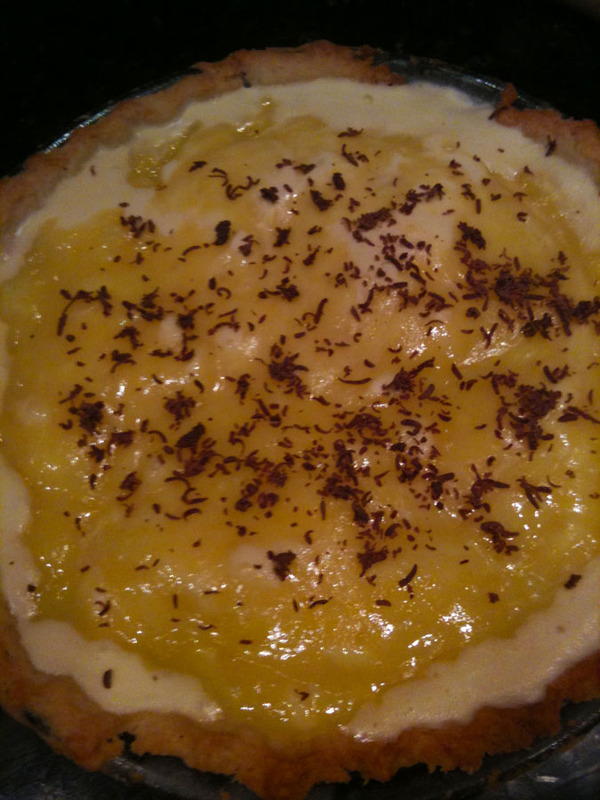 But hey, the yard looks nice and the work to get there further motivated me to cook dinner for my lovely wife, and to create pie number 28, the Foggy Bottom Lemon Curd Pie. This is a non-bake pie, but I did a sweet crust from scratch, courtesy of the 500 Pies and Tarts cookbook. It didn’t come out that great and I’m not sure why. I mean, the crust doesn’t look great but I’m sure it’ll taste really good. The edges retreated a bit and the fluting, that looked so wonderful in dough (thanks Claudius Rex! ), ended up disappearing. The filling is from a recipe at cooks.com. The original recipe is actually called Black Bottom Lemon Curd Pie, but I can never find chocolate nilla wafers. So I did my own crust and changed the name of the pie. Plus I used a glass pie dish and when the pie is frozen it actually has a foggy bottom. Is that bad? Combine the flour, salt and sugar in a medium sized bowl. Cut the butter into small chucks and add to the flour mixture. Using a pastry blender or two knives in a criss-cross motion, blend the butter into the mixture until it has the consistency wet sand (sweet, delicious wet sand)with a few pea-sized pieces remaining. To roll it out, I used a cloth dinner mat. Flour the surface, cover the dough with your plastic wrap and roll out into a 9 inch circle. I was able to pick up the crust and transfer to my pyrex pie dish. You can also just slide it from the cloth surface to the pie dish. Trim or fold the excess under the edge of the crust and flute. Place a pie weight or beans in tin foil over the center of the crust. Bake at 350 degrees for 10 minutes. Remove the weight from the crust and bake an additional 5-7 minutes or until the edges are golden brown. Melt the butter. Stir in the lemon juice, zest sugar and salt. Cook until the sugar is dissolved. Beat the eggs (don’t just yell at them); gradually blend in the lemon mixture into the eggs. Return to heat. Cook over LOW heat an additional 2-3 minutes or until the filling starts to thicken. Do NOT allow to boil. Remove from heat, allow to cool and then chill in the fridge for 15 minutes or so. Nuke your ice cream for about 15 seconds in the microwave and slather along the bottom of your crust. Use the whole pint. Remove the cooled lemon curd from the fridge and place over the top of the ice cream. Freeze for about 6 hours. Or until you can’t stand it anymore and must have a piece. You can add shaved chocolate as a garnish if you’re feeling it but it isn’t necessary. It’s very tasty. The lemon is a nice partner to the vanilla ice cream. It’s just a pain to cut a piece of solid ice cream and lemon curd. I recommend a heated knife to cut yourself a piece. Or you can just brutalize it with a large spoon.